Derby Burton & Dist. SR Fed. Derby Burton & Dist. S.R. Fed. Burton & S Derby Fed. Burton & S. Derby Fed. Why Are Pigeons Getting Worse? Derby Burton & Dist. S. R. Fed. (Page1)Pre 13-10-2015 _____________________________(Page 2) Click Link Below for Articles & Loft Reports uploaded from 13-10-2015 onwards.Articles & Loft Reports Page 2. A compilation of thoughts from Jim Emerton. The Blame Game by Jim Emerton The exceptional 'Den As' raced by Couwet-Thomas of Belgium by Geert Pollin Jim Emerton asks: Are Marathon Men Barking? Getting birds to BICC marking from the Midlands & the North by Jim Emerton John Rumney by Gareth Watkins Jim Emerton asks: Why do we sometimes fail? 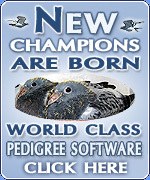 The Romance of Racing by Jim Emerton Negativity in Pigeon Racing by Jim Emerton Jim Emerton asks: What is a good pigeon? Jim O Hara of Lanarkshire by Tom Corrie Jnr Jim Emerton looks at the North/South Divide Jim Emerton asks: Basket or Judgment? Room at the top, where greatness awaits. Jim Emerton's Barcelona rallying cry.